Fritz Haeg is a multifaceted contemporary artist, designer, architect, community organizer, writer, and educator. 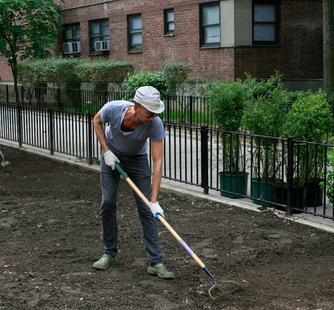 His recent projects include Sundown Schoolhouse - an itinerant educational program; Edible Estates - replacing domestic front lawns with edible landscapes; and Animal Estates - making homes for native animals in cities around the world, which debuted at the 2008 Whitney Biennial. He has also produced and exhibited projects at Tate Modern; The Guggenheim Museum; SALT Beyoglu, Istanbul; The Aldrich Contemporary Art Museum; San Francisco Museum of Modern Art; Casco, Utrecht; Mass MoCA; the Institute of Contemporary Art, Philadelphia; the Wattis Institute; The Indianapolis Museum of Art; the MAK Center; the Center for Advanced Visual Studies at MIT, among other institutions. Haeg studied in Italy at the Istituto Universitario di Architettura di Venezia and Carnegie Mellon University School of Architecture. He is a 2011 Rome Prize fellow, a frequent MacDowell Colony Fellow, and nominated for National Design Awards. He has variously taught in architecture, design, and fine art programs at Princeton University (2012), California Institute of the Arts, Art Center College of Design, Parsons School of Design, the University of Southern California, and Wayne State University in Detroit as the Spring 2012 Elaine L. Jacob Chair in Visual Art visiting professor. Recent books include "The Sundown Salon Unfolding Archive" (Evil Twin Publications, 2009) and the expanded second edition of “Edible Estates: Attack on the Front Lawn” (Metropolis Books, 2010).